Most of us think of Germany as one of the most energy-progressive countries in the world. But in recent years, it's also increased its dependence on a form of energy that's anything but clean: coal. And it's demolishing or relocating entire towns to get at it. A blade wheel excavator works at the surface mining Profen of the Central German Lignite Corporation (MIBRAG) southwestern of Leipzig, eastern Germany. AP Photo/Eckehard Schulz. Vineta Church is anchored on an artificial lake created after open cast mining passed through the region. AP Photo/Jens Meyer. A bucket-chain dredger mines overburden in the surface mining "Vereinigtes Schleenhain" of the Central German Brown Coal company MIBRAG, south of Leipzig, eastern Germany. APN Photo/Eckehard Schulz. Then it's just a matter of getting the stuff—millions of tons of it—onto conveyor belts for processing. The complex part is the sheer scale of the operations, which involves some of the largest bucket diggers in existence. Top: A view at a spreader surrounded by scaffolding for refurbishment. AP Photo/Eckehard Schulz. Bottom: An excavator in the surface mining Vereinigtes Schleenhain of the Central German Brown Coal company MIBRAG, south of Leipzig, eastern Germany. APN Photo/Eckehard Schulz. 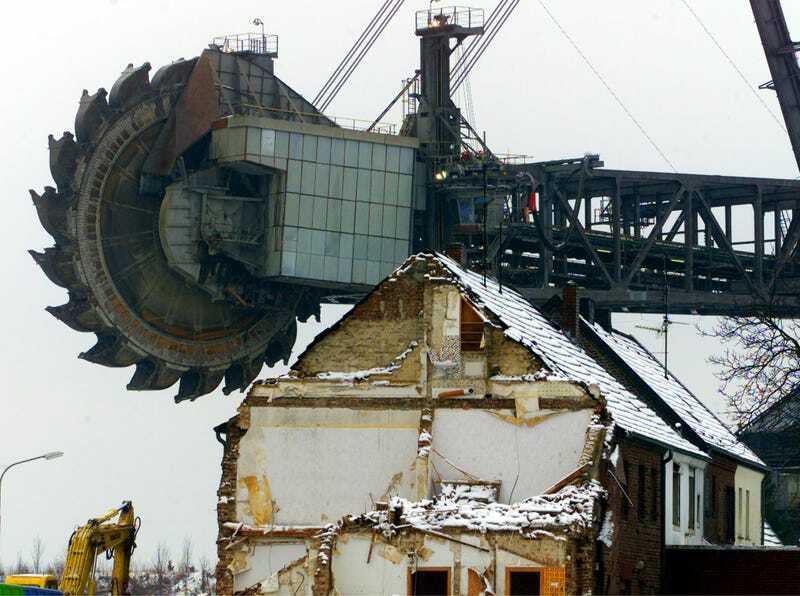 Lead image: A giant paddle wheel of a bucket excavator of the nearby lignite mine is seen at a demolition site at Elsdorf, near Cologne, western Germany. AP Photo/Frank Augstein.